Based out of Bakewell and Derby offices, Gravity Digital has worked with scores of Derbyshire-based businesses across a broad range of industries as well as working with many more companies further afield. Owned and run by three directors, Debbie Porter, Andy Smith and Sharon Steven-Cash, the company provides a full range of digital marketing services for over 100 clients including household names like Mr Fothergill’s and HECK, as well as businesses closer to home such as HUUB Design, Wheathills and Davis Derby. This award shortlist announcement is the latest in an exciting string of awards Gravity have received during the last year. It has been a pretty amazing journey. Gravity’s awards in the last 12 months started with a win for “Best Rural Creative or Digital Business” at the CLA sponsored Rural Business Awards in October 2016. This was followed by the FSB & Worldpay 2017 “Small Business of the Year (East Midlands)” where Gravity were winners in the East Midlands region. The agency were then announced as finalists of the “Creative Industries Business of the Year” in the Derby Telegraph Business Awards 2017 and have recently scooped “Best Digital Marketing Agency” & “Excellence Award for SEO” in the SME Midlands Enterprise Awards 2017. Of the latest award nomination, Director Debbie Porter said: “We’ve had a glittering journey in the last 12 months which has been really exciting. 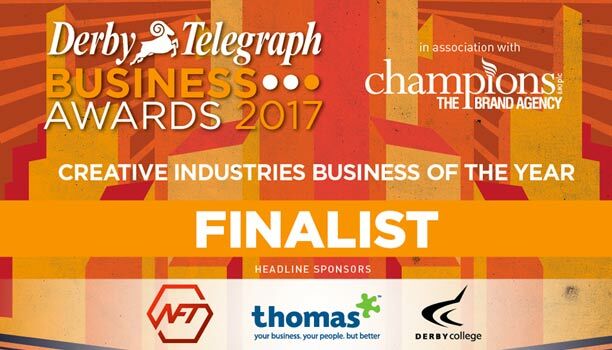 To be shortlisted for the Derbyshire Times’ “Small Business of the Year” award is the icing on the cake and we all have our fingers crossed for the awards evening on 9 November.